Claire and Terrell’s wedding at the Crane Estate, Castle Hill. 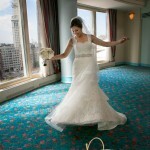 Claire has got to be one of the happiest brides I’ve ever met and, together, Claire and Terrell are an ecstatic couple! It was such a joy to photograph their wedding day, which was perfect in every respect. Please enjoy the slideshow of photos , and add your comments and best wishes below. Thanks! Melissa and Jason’s wedding in the North End and Boston Harbor Hotel. Check it out! I managed to get on the other side of the camera for a change! 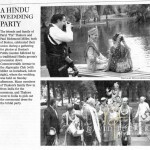 Here’s a shot of yours truly in the Boston Globe, photographing Pia and Paul’s spectacular Hindu wedding in the Boston Public Gardens.